It's hard to believe ten years have passed since our high school days. Come to the reunion and see how your classmates have changed with the times. Catch up with old friends. Catch up with people you haven't seen since graduation. We hope your spouse/significant other will join us on October 14th at the Bright Leaf Forum. 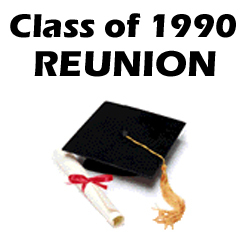 Spread the word to the other HCHS Class of 1990 graduates! It only comes once every ten years!! Optional: Pictures will be taken at an additional cost and a directory will also be available. If you have any questions concerning the reunion, you may contact one of the committee members listed above. Also, if you know any addresses of other classmates PLEASE send them in with your payment. Click here for the registration form!! This website brought to you courtesy of GCR Online.